1.) A combination of colostral extracts that provide immune intelligence, balance, direction, regulation and enhanced effectiveness. Thymus gland extract further potentiates these benefits. 2.) 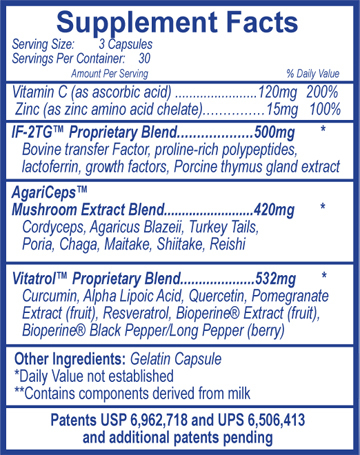 A blend of eight well-recognized, health-enhancing mushrooms, all ORGANIC. 3.) A combination of nutrients that demonstrate both remarkable benefits of their own, and the ability to boost the effectiveness of some of the other formula ingredients. Transfer Factor Basics™ is a great foundational immune-health promoting product and the recommended initial product of choice for those individuals with multiple or extreme sensitivities. It is safe and effective for children & infants as well. 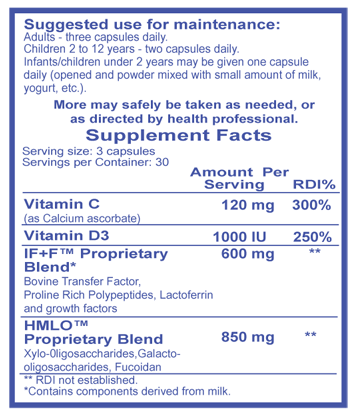 This is an exceptional proprietary blend of transfer factor, lactoferrin and other beneficial colostral extracts, plus Vitamins D3 and C. The addition of Fucoidan, Xylo-oligosaccharides and Galacto-Oligosaccharides, provides AN EVEN WIDER RANGE OF THE IMMUNE SUPPORT NUTRIENT BENEFITS COMPARABLE TO THOSE FOUND IN HUMAN COLOSTRUM. It serves as a vital immune health-promoting product in and of itself, but is also a tremendous adjunctive measure when used with other immune support products.